From an Oregon Crusaders press release: Oregon Crusaders members and staff greatly anticipated their audition weekend and enjoyed quite a turnout of prospective new members from all over the west. The preliminary auditions were held at Skyview High School in Vancouver, Washington, just across the Columbia River from Portland, Oregon, on Nov. 27. The total number of potential Crusaders for 2005 that attended was 116. Twenty-nine of 30 brass vets returned and were part of the 59 total horn players in attendance. A line of 25 snare drummers crowded tightly into the choir room at Skyview, along with many bass and tenor drum hopefuls. It was calculated that the Crusaders had a 90 percent vet return rate! 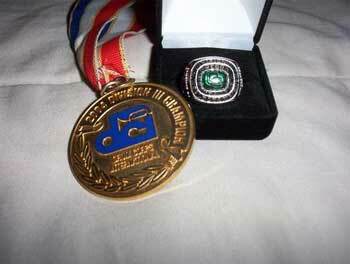 The Division III medal and Oregon Crusaders ring. Because auditions were held on the Saturday of Thanksgiving weekend, numbers are expected to continue to go off the scale, certainly by Crusaders standards, until the corps members fall into the final cut come February 2005. Staff is extremely pleased with the numbers thus far. The OC design staff remains in tact from the championship season of 2004 and will be augmented with several talented new additions. Josh Pruitt will once again serve as drum major. The Oregon Crusaders will be presenting in 2005 a show entitled "The Sands of Time," with a decidedly Arabian feel. The show will pull from the musical talents of contemporary composers Melillo and Gillingham. Included will be an original work by Lewis Norfleet, who returns once again to OC as the horn book arranger. Ronnie LaGrone, for a second time, will be arranging the drum score. LaGrone will write parts for the front ensemble with Brian Mudgett; Kurt Jull will design the drill. Mike Leone will return as program director and brass caption head. For a full run down on the OC staff for 2005 including bios, see the Crusaders'Web site. The Oregon Crusaders are pleased to announce that they have entered into a new relationship with Dynasty Corporation and members will enjoy an outstanding full compliment of new equipment at the January camp. Stanbury Uniforms and Promark also will continue to endorse OC for 2005. The icing on the cake at audition day for members and staff of the 2004 season was the presentation of the eye-popping championship rings manufactured by Jostens Corporation. It was a terrific day! Anyone interested in joining the Oregon Crusaders are encouraged to attend the January camp at Hockinson High School in Brush Prairie, Wash., on Dec. 17, 18 and 19. See the Oregon Crusaders'Web site for complete information.